Thank you Michelle, we are glad you enjoyed your stay and would agree that the location is amazing - we will consider your suggestion and look forward to seeing you again. Excellent location, beautiful pools and gardens, just need to make sure you book a superior room. Overall it was really good. Although we were warned about the renovations, two days of jackhammer noise was a bit much to have to put up with and as we were only there for 6 nights it did cause some inconvenience.Thankfully though the rest of my family including my 18mth grandson were in the other building because it would have been impossible for him to have had his daytime sleep. Hopefully if we return next year there will not be any jackhammer work. The unit we occupied was well located overlooking the beach, comfortable bed, good appliances. The unit was cleaned after a few days stay. We have stayed at Oceana 5 times love the location and the size of these apartments. Were only there for a weekend but location, view and overall setup and comfort of the apartment was excellent. All good. Love the location. Overall experience was wonderful. Only issue was that we booked 2 apartments & they were not on the same level. This meant every time we wanted to be with each other it meant a trip to the foyer to allow access to the other floor. Past guest, location ideal and we continue to find that units are very well maintained, whilst aging it is no impediment to a lovely stay. I have stayed at Oceana several times + once again I wasn't disappointed. I will be back. Thank you Gavin, it was a pleasure to have you stay with us at Oceana and we look forward to seeing you again. A great stay as always . Apartment was spotlessly clean , quiet , common areas beautifully maintained , love the cafe over the road, great holiday. Thank you Craig for your review, glad you enjoyed your stay with us and we look forward to welcoming you back to Oceana On Broadbeach. Wonderful location, friendly service and great facilities. We ware 4 sisters who couldn't find fault with our 3 night stay. Great size apartment. . Great Location…. Great weekend. good. But shower in bathroom (not the ensuite) was pretty poor. Wonderful clean, modern apartment with great facilities. Very quiet and close to everything. Our week with the family was great! The standard of our stay was somewhat compromised compared to our two previous visits due to building painting work and noise from demolition work across the road. Thank you for your review, we do apologize for the maintenance inconvenience. You are more than welcome to call direct for further bookings to ensure your specific room request is met. Thank you, Donna. Loved our stay at Oceana. Perfect spot. Very good. Clean, comfortable, great facilities, well maintained. Only disappointment was that there was major building maintenance underway during our stay which meant we weren't able to enjoy the balcony as much as we usually would. Guests should be told about sigmificant maintenance work that has this level of impact on their holiday. It won't stop me booking next year but i will call to verify maintenance schedule before I book. Found the apartment very nice, but the decor was quite dated especially kitchen and carpet, but genrerally clean and all items usable. As one of the reasons I booked with Oceana was the balcony, I was disappointed that there was no warning of the painting and the restrictions on the balcony use, particularly when I booked only a few weeks earlier. Fantastic location, very clean and well maintained. The pool, spa and grounds are always immaculate. Great location, spacious apartment, easy walk to restaurants. Fantastic location. Beautiful apartment. Our second visit ,,, we will definitely be back! Great location and we had a great view from our room. Staff were very helpful and friendly. This is our second time we have stayed here. It is a well maintained complex and the units are large and spacious. We will bring the family next time and we would love a three bedder cater for Adults in the bedding department. not single beds. There were some lights that didn't work and one that flickered. Also while it was obvious that renovation works are required (worn carpets and bathroom fittings) and they need to be completed at some time, more could be done to minimise the impact of the works. We thought that low season occupancy rates should have allowed room bookings to be planned to avoid the core work areas. Jack hammering of tiles does create noise problems for the most of the building but it is really bad in the unit directly above the work. If bookings were high enough not to allow a buffer between the work area and occupied units then it would be fairer to advise the type of works to occur and times they will be conducted. Prior knowledge of the work would allow people to decide if the accomodation would be suitable. As it occurred there were two days when the unit we paid for could not be occupied for much of the day, due to noise levels. This is not what we were offered at the time of booking. The first time we had stayed with you, we found the apartment to be spacious and in a great location and a short stroll to the beach out of the back gate. Very good location with everything needed in the apartment. 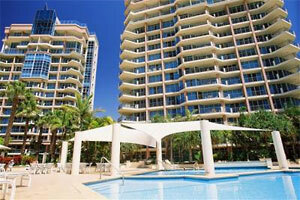 Short walk to Broadbeach and quick drive to Surfers Paradise. Right next to the beach and parks. Great pool area and BBQ. Would definitely recommend this accommodation to anyone and will be back to stay again. Just lovely. Only wish we were on a higher floor to really enjoy the view. We really enjoyed the apartment and complex everything was kept immaculately clean.